It is the early 1960s and we are going for a stroll down BrickHills Avenue with builder Andrew Tate. 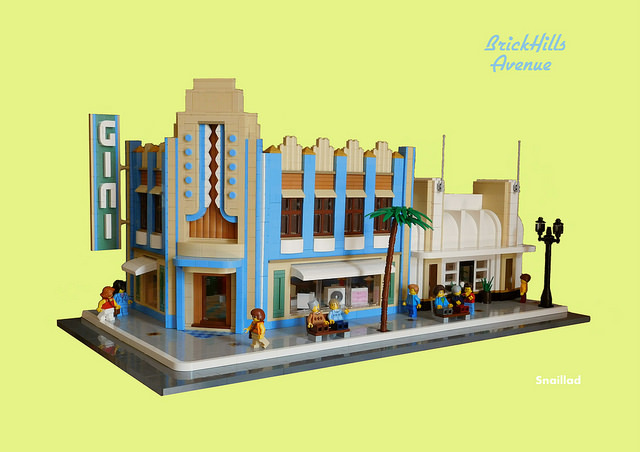 Andrew has created a lovely scene with Art Deco-inspired architecture centering on Gini’s home electrical store on the corner. There is definitely evidence of the source of inspiration being a movie theater, and Andrew mentions the Warner Beverly Hills theater and Sunset Boulevard theatre at Disney Studios in his own description. This build is not just a façade, as Andrew has also designed some interior views. The image below is clearly from Gini’s home electrical store. 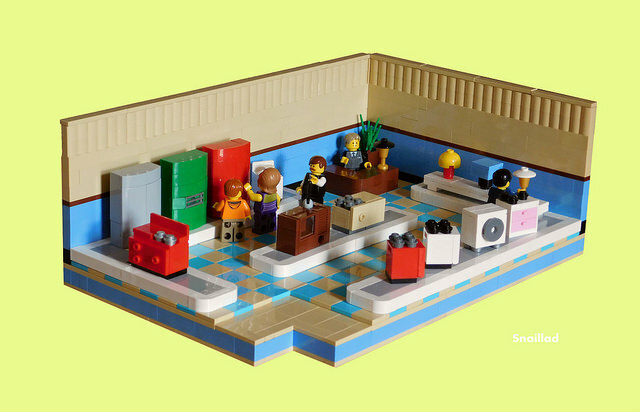 It looks to be a source for colourful refrigerators, washing machines and expensive cookers — more than enough to meet the desires of a mini-housewife!